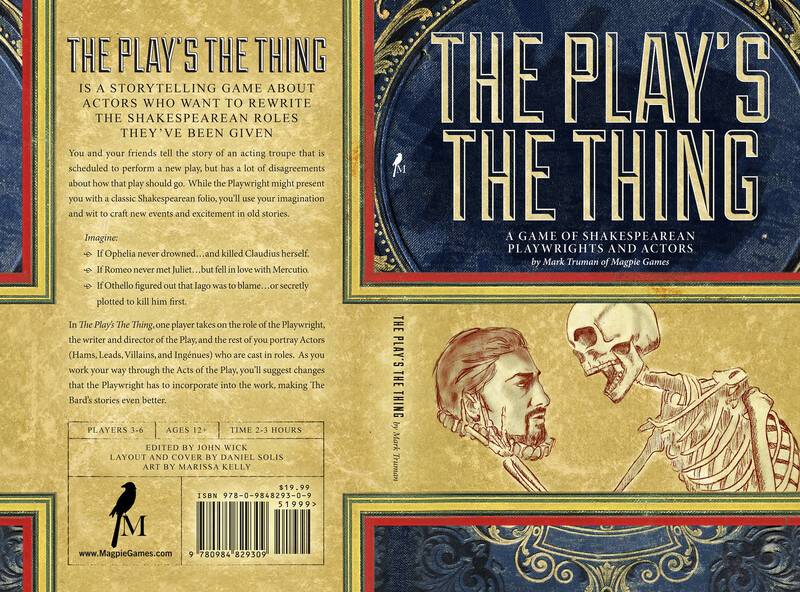 Earlier this year, I laid out The Play's the Thing, a Shakespearean roleplaying game from Magpie Games. I did the cover and interior layout, but the let's focus on the cover design. Marissa Kelly had the art you see above already made for the cover, so my job was mainly to create a suitable frame around it. I pulled some old book cover textures to create the feel of a well-worn play book. It took quite a bit of cutting, pasting, blending and warping to get all these textures to fit together naturally. The blue area you see above is actually from a different cover than the striped area. Hope it looks relatively natural. Take a closer look and tell me if you can spot the seams. Magpie Games super-chill people and a real pleasure to work for. Pick up the The Play's the Thing from their site or at your local game shop.